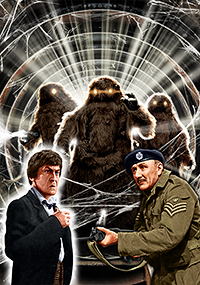 With the long-awaited release today of the final Classic Doctor Who DVD, I thought it was high time to wrap up some uncovered stories from late in the range. 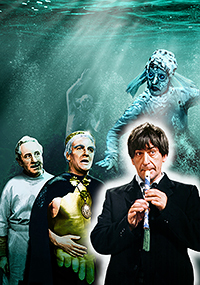 So here, at last, are covers for a foursome of Second Doctor releases: 'The Underwater Menace', 'The Moonbase', 'The Enemy of the World' and 'The Web of Fear'. I haven't much to say about their creation as they all use techniques and arrangements I've discussed before. The trickiest part was finding suitable shots of the Doctor, especially as I aim to use images from the story I'm illustrating where possible. However, Troughton must be the least photographed of all the Doctors, so for these covers I had to look a little wider. 'The Moonbase' was easiest as there's a good shot of the Doctor, Ben and Polly in the TARDIS, which I had planned to use as was. But knowing the background would be Cybermen on the Moon, I thought it would be nice to have the Doctor in his spacesuit. However, I didn't really want his face obscured by the goggles he wears, so I decided to transpose the head from the former photo onto one of the helmeted Doctor as the angles of the two shots were close enough for the combination to be convincing. For 'The Underwater Menace' I used one of the publicity shots of the Doctor in the TARDIS that were taken early in his tenure so fitted his look in this story (and saved me at least one colouring job!). Most are a bit too 'posed' but this one of him playing his recorder wasn't too outlandish and ties into his use of the instrument to knock out Zaroff in episode three. The two Season 5 stories were trickier and I had to resort to looking at surrounding stories, eventually using two shots from 'The Mind Robber', which was at least part of the same recording block. The one on 'The Web of Fear' was straightforward enough, just requiring the painting out of Jamie where he was gripping the Doctor's arm. That on 'The Enemy of the World' was clearer but much softer. But I had a good quality close-up of his face that fitted the pose so this is another head transplant. When it came to secondary characters, I was glad there are a couple of photos of Professor Zaroff that allowed me to feature him, being the main villain of 'The Underwater Menace'. In both he's standing behind King Thous and I had hoped to swap them round by painting in Zaroff's hidden arm and torso. But I couldn't find suitable material for the patch, either by duplicating the visible side of his body (the mirroring was too obvious) or using other stock images, so I had to leave him in the rear. I did flip Thous, however, to better fit the composition and suggest his blindness to Zaroff's true nature. Unfortunately the Cybermen have no human stooges in 'The Moonbase' and although there are good photos of Hobson I didn't want to feature him as he's ultimately on the Doctor's side. I could have stuck with just the Cybermen, as on 'The Tenth Planet' and 'The Tomb of the Cybermen' but the space in the bottom-right felt a little empty. So I decided, given the story's title, that the eponymous base deserved to be seen and, to tie in with the firing of the Cyber-cannon, I thought it would be nice to represent it as being in the sights of said weapon. 'The Enemy of the World' had to feature Salamander, of course, and a shot of duplicitous Giles Kent fitted with him nicely. Finally, for 'The Web of Fear', while it's arguably a bit of a giveaway as to who the Intelligence's agent is to feature Sergeant Arnold, we all know that already and it's such an iconic image from its use on Chris Achilleos's Target book cover. Plus I had a nice high-resolution copy from the publicity surrounding the story's rediscovery. Finally the backgrounds (which are actually the elements I begin with). For 'The Underwater Menace' the Fish People were a given, especially as most photos from this story are of them. I had planned to include some more in a group but in the event they just seemed to clutter the space too much so I kept it simple. One thing I always planned to do was improve the look of the creatures' eyes, which are a poorly executed part of the costume, so I searched for images of actual fish eyes and chose a suitable one that had a similar look to the originals but more three-dimensional and realistic. 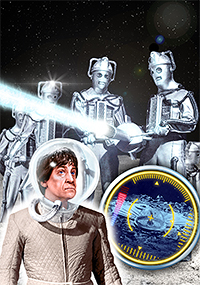 For 'The Moonbase' there are several nice images of the Cybermen on the Moon and I always had this one of them with their cannon earmarked for the cover as I knew it would be fun adding in the laser beam (with a touch of artistic licence enhancing what's seen on screen). Given the title 'The Enemy of the World', a view of the planet is an obvious choice. My initial ideas were to use a map of the world so I could include some form of link between Australia and Hungary, the two locations in the story. 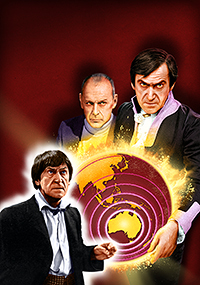 But this was in danger of being too similar to Alister Pearson's cover painting for the Target book reprint, so I went for a globe instead focusing on Australia, then had fun with the explosions to suggest the danger the planet was in from Salamander's operation. I paid homage to Pearson's work instead by using his colouring for Salamander's jacket. Finally, what else can you do for 'The Web of Fear' then Yeti in the underground? I didn't want the cover to be too dark, however, so decided to have the glow of the Intelligence's foamy web backlighting the creatures. This created a rod for my own back as not only did I have to cut out three furry Yeti, which is painstaking enough, I then had to render them as if lit from behind with light bleeding through their fur. Phew! I'm pleased with the result, however. These four covers finally fill in the gaps in the DVD collection, so now there's a Velvet Jacket cover for every release. However, there are a handful of revisited stories for which I need to update the covers to reflect the new contents. Now I'm on a bit of a roll I'm hoping to have these available soon. Some just need their illustrations tweaking, but one or two will be completely redesigned.